Inspired to Create by…Saint Patty’s Day! It has been a busy last few weeks for this designer. It has been such a whirlwind I am not even quite sure when I posted last. There are some big changes in the air & the biggest one that has taken much of my focus has been my new gig writing for the online examiner as the Salt Lake Interior Design Examiner…my official title. As much as they want local content, design is design…so I have made it a point to make sure my articles are informative for anyone who wants to get inside my extremely complex designers head…scared or intrigued? No really, it is not as bad as it may sound & I think it is worth checking out. St. Patty’s Day is coming to an end & first let me just clarify why I call it this, lest you assume I just enjoy a bit of sacrilege…which I do. I am fully aware that it is called Saint Patrick’s Day but this day is even more meaningful to me than a day to dye your beverages green & wear the color of grass from head to toe. Today, March 17th is my mothers Birthday. Now don’t go asking which one because she has never confessed her age to me & since I was never the child to snoop through the house trying to find gifts & hidden secrets, I have just left it at that. If I really need to know I can find out. Since her middle name is Patricia I often will call it Saint Patricia’s’ Day (truly she is one) but you would all be seriously confused….& sure I was disturbed (which isn’t impossible). There is also that little dilemma that my exes name is Patrick. You understand now right? These past two days I’ve restlessly needed a break from my writing & at the spur of the I moment came up with two ideas for a couple of little paintings. I have been intrigued with the idea of using seasonal or themed paintings & art work for decorating with during the holidays. 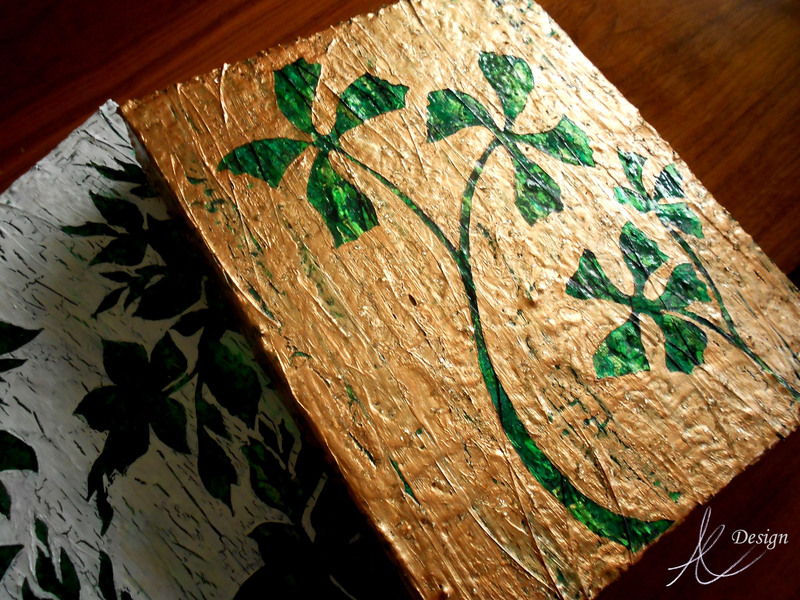 I had two little canvases that were already prepped with green textured paint that I had set aside. All of the sudden I decided, quite at the last-minute to put all my focus into them & transform them into something wonderfully lucky. Here are the results. May you all find rainbows with gold at each end & may the grass always be green on your side of the pasture. May the Luck of the Irish be with you my dears!